CLAIM: IRAN IN SYRIA RUNNING COVERT WAR COSTING BILLIONS……. – The Tundra Tabloids……. CLAIM: IRAN IN SYRIA RUNNING COVERT WAR COSTING BILLIONS……. I’m told that the Daily Mail’s source, the National Council of Resistance of Iran (NCRI), are using incorrect numbers but the Awsat al-Sharq has quoted a Kurdish official who said that the IRGC has set up camp between Kirkuk and Mosul. So this definitely has some smoke behind it, i’m just waiting to see the flames. 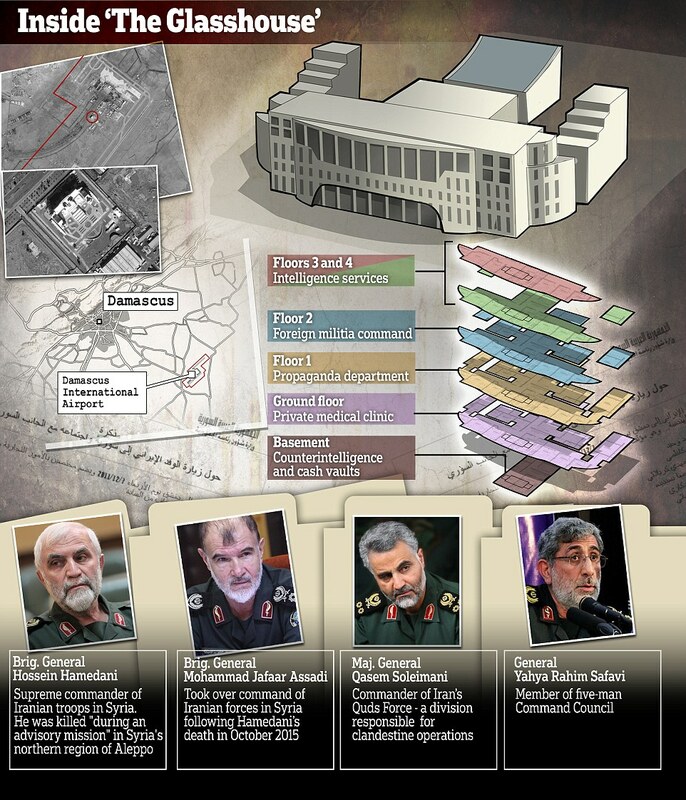 Iran is shoring up the Syrian regime from a secret HQ in Damascus nicknamed ‘the Glasshouse’ – and commanding a huge covert army in support of Assad, according to leaked intelligence passed by activists to MailOnline. The National Council of Resistance of Iran (NCRI) claims that the theocratic state’s Supreme Leader Ali Khamenei has spent billions in hardware for its ally Bashar al-Assad in the last five years – and runs operations on the ground from a five-floor monolith near Damascus airport. The Iranian HQ, which plays a pivotal role in supporting Assad’s regime alongside Russia, contains intelligence and counterintelligence operations, and has vaults packed with millions of dollars in cash flown in from Tehran, claims the NCRI. The allegations are contained in a dossier of reports apparently leaked by senior sources inside Iran’s Revolutionary Guards and collated by the dissident activists who oppose the Iranian regime. The dossier – which could not be independently verified but was described as ‘credible’ by intelligence experts – makes the bold claims that Iran controls the biggest fighting force in Syria; has military bases throughout the splintered state; and has amassed a war-chest far greater than feared in support of the Syrian president. Previous Post Previous Post TURKISH CONTROLLED MEDIA LISTS NAMES OF GULEN SUPPORTERS IN NETHERLANDS……. Next Post Next Post CALAIS MUSLIM SETTLER JUNGLE READY TO BLOW…….